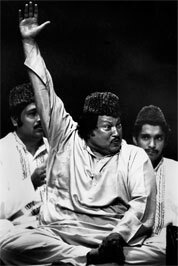 Nusrat Fateh Ali Khan was born in 1948 in Fajsalabad, in the Pakistani province of Punjab. He was a member of a family whose male descendants had specialized in the performance of religious music qawwali for over 600 years *. The music has developed on the basis of Sufism - the mystical trend of Islam. The essence of qawwali is prompting a religious trance enabling a direct contact with God. Nusrat Fateh Ali Khan’s father, a great master of qawwali and respected musicologist, taught his son the basics of this music and passed on the knowledge of classical hindu ragas and the Indian art of vocal khyal based on improvisation. Talented, divinely gifted Nusrat Fateh Ali Khan has contributed to the popularization and development of qawwali by combining all these musical genres. In the literary layer, this was Sufi poetry, originated in Persia, India and Punjab province, which constituted the spiritual dimension of his creative activity. Even before his death Nusrat reached the status of the greatest voice of the Indian subcontinent. His voice, covering 5 octaves, became recognizable in Bombay, the northern Afghanistan, remote villages of the western Baluchistan and Bangladesh. His concerts - mysteries, lasting for many hours, were filled with an excited audience, who paid no attention to the religious differences of other listeners, which even now is an exception among Muslims from Pakistan and Hindus from India. Nustrat’s music was not limited to India and Pakistan. It also won the recognition of the Western world and built a bridge between Eastern and Western civilizations. Nusrat recorded more than 120 albums for various records companies in Pakistan, India, Europe, Japan and the United States. He also was the most important and influential artist in Peter Gabriel's studio - "Real World Records." He cooperated with many other well-known artists of the Western world, including Asian Dub Foundation, Edi Vedder from Pearl Jam and Massive Attack. His voice can also be heard in the famous final scene of crucifixion in the film "The Last Temptation of Christ" directed by Martin Scorsese, "Natural Born Killers" by Oliver Stone and in "Dead Man Walking" by Tim Robbins. Some directors from Bollywood have also often used his music. The success of the soundtrack from the movie "Bandit Queen" by Shekhar Kapur has not been repeated yet in the Indian filmmaking. * Qawwali, deriving from the Sufi music tradition of Pakistan, India and the Middle East, is a religious song accompanied with vigorous rhythmic clapping and tabla (percussion instrument from the family of membraphones), and the melody of harmonium - a kind of small organs. The qawwali band consists of 10 - 14 members seating on a stage during their performance. The band is led by the voice of the leader, and several voices create a choir, repeating leader’s phrases. The repeated chanted phrases, the rhythm of tabla, beautiful harmonious melodies and mysticism of the sung poetry are designed to make listeners fall into a musical trance thus enabling contact with God. These selected lines and a part of an interview gave by Nusrat, represent the artist’s attitude towards people and God. They help to understand his art, so full of acceptance for the differences between religions and cultures, where love in relations among people should always be a priority.